“Next!” calls out the receptionist as the heavily pregnant woman takes another tired step forward and inches her way ahead in the serpentine queue to collect the admission form for her yet to be born child. Unknowingly the baby feels yet another jerk in the womb as she patiently waits along with her mother in the queue, one of many queues that would soon be dominating her life. 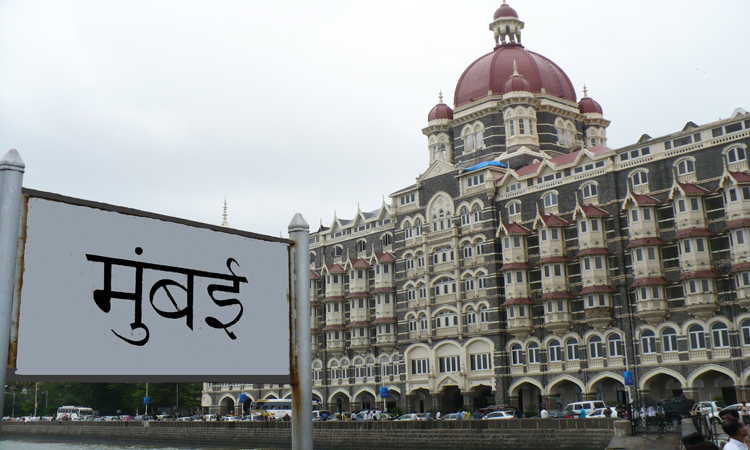 Welcome to my city – Mumbai or Bombay as I like to call it. For 32 long years (before I moved out of this city) I lived in this mayhem of queues, traffic, crowd and all kinds of pollution. Whether it was walking though knee deep muddy waters during the monsoon, eating the best of roadside chaats with flies hovering above my head or driving like a possessed woman jumping traffic lights, my learning curve always showed an upward trend! I learnt the art of getting into and off the local trains with no physical exertion from my side, just by standing right in the centre of the crowd! I learnt how to sweet talk my way out of trouble when pandus (traffic policemen) caught me exceeding the speed limit, God bless my fluent Marathi! I also learnt how to protect my front, back and my personal belongings while walking through a crowded or on an isolated street, both holding dangers of different kinds! 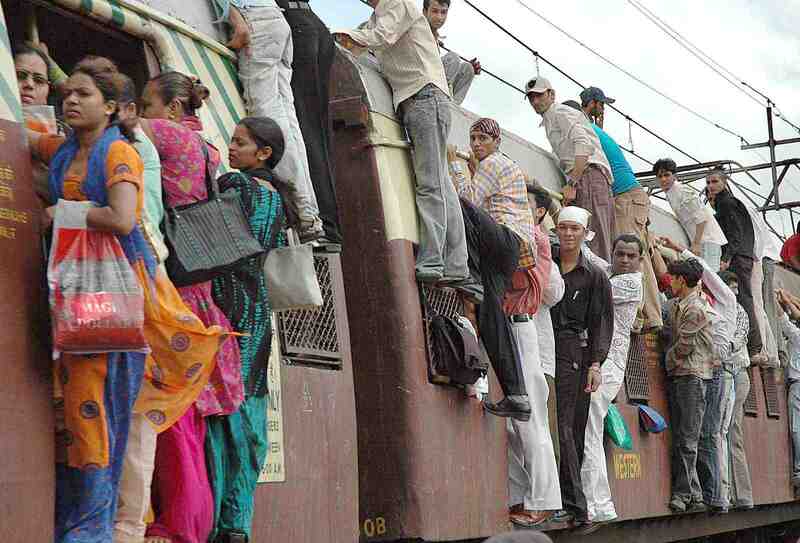 I think we all Mumbaikars are born with this sixth sense…..the sense of survival. As kids we are taught how to love and respect others and yet at the same time we are also taught how to compete fiercely with each other and with the world! After a long awaited child is born, instead of cherishing and enjoying quality time with this precious bundle, parents are in a hurry to produce a second one so that “दोनों साथ साथ जल्दी बड़े हो जायेंगे” (both will grow up quickly together). Then there is this mad rush to put them in a pre-school and suddenly an urgent need to make them champions, cramming as much as possible into their little heads at an alarming pace, after all – “Everyone else is doing it na!” Fun activities like swimming are also dreaded by the children as most swimming lessons have got nothing to do with floats or techniques “”पानी में एक बार धक लगा दो, अपने आप सीख जाएगा फटाफट !” (Push him into the water once and he will learn how to swim quickly!). And so we all learn…. how to swim…..how to survive….. फटाफट! 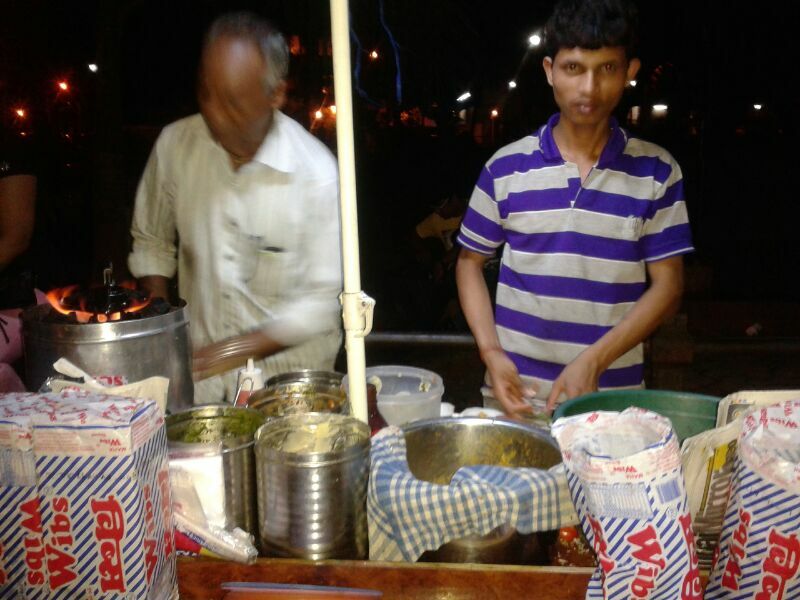 A roadside sandwich-wala making sandwiches फटाफट! But as alarming as it may sound, the truth is that we all love our life in this city. Love the opportunities that it has to offer and at the same we accept the difficulties that we face. These difficulties in fact often bind us together and bring about a sense of unity that is apparent in times of need, like during the recent terrorist attacks in the city or the bomb blasts before that or probably just a “regular” monsoon deluge! The city teaches us how to survive. The spirit of survival apparent in the smiles of beggar children on the street, in those people who sing bhajans (devotional songs) while being crushed like sardines in a local train, in the sweat of the local भाजीवाला (vegetable vendor) or पाववाला (man who delivers bread) who diligently deliver his stock of fresh produce at our doorstep come rain, storm or sunshine. These are the people who make this city what it is. A city of dreams. 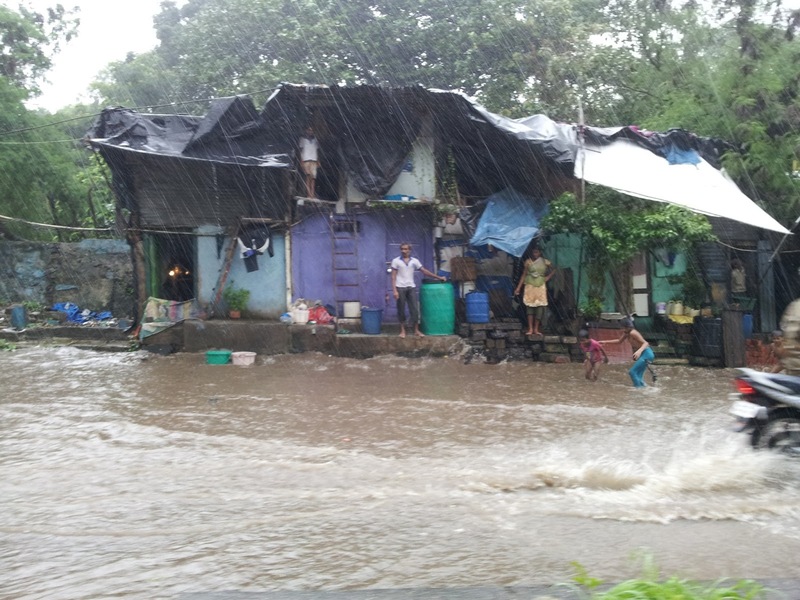 Water logged roads – “regular” crisis during monsoon!